Users have found X-Mirage a perfect Mac software to mirror iPad/iPhone screen to Mac and record screen activities since the debut of X-Mirage. However, many of them expressed the pity of not being able to record microphone voice with X-Mirage. 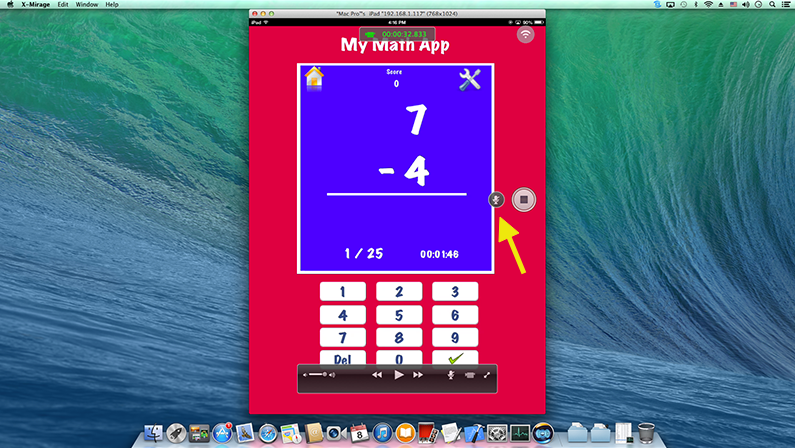 Now with the new release of X-Mirage for Mac 1.06.5, it is extremely easy to record iOS screen videos with voiceover, such as app tutorials, coursewares, etc. See the below microphone icon? It appears after you clicking the round record icon which is used to record screen and sounds from iPhone/iPad/iPod touch. Click the microphone icon once and them speak over the Mac microphone to narrate the iOS screen activities. Whenever you want to pause or stop the voiceover recording, click the microphone icon once again. Now download X-Mirage for Mac 1.06.5 and record any iOS app with narratage.